Five alumnae of Buffalo State’s Fashion and Textile Technology (FTT) program returned to campus October 18 to participate in the symposium “Cotton: Perspectives in Industry, Technology, and Innovation.” They were among seven professionals working in various facets of the fashion industry who shared their expertise during a full day of interactive events with students. Marcy Gang, ’01, an executive account manager with Cotton Incorporated, shared her career trajectory that started at Acumen in Buffalo and led to her current position with the Cary, North Carolina-based not-for-profit organization. Gang also talked about how drastically the fashion industry has changed since she graduated and the paramount importance of making clothing sustainable, something Cotton Inc. is constantly working toward. Alumna Colleen Coughlin,’06, quit a coveted job as a Victoria's Secret designer to commit herself to promoting sustainability. She said she felt empty when she saw how much fabric was trashed each day. She then created her company, The Full Edit, in which she helps consumers organize, purge, and style their wardrobes. She also works with companies to repurpose clothing. She encouraged students to consider the environment in whatever fashion careers they end up pursuing. Other symposium speakers represented U.S. Customs and Border Protection, the American Association of Textile Chemists and Colorists, Bureau Veritas Consumer Products Services, and Fair Indigo. 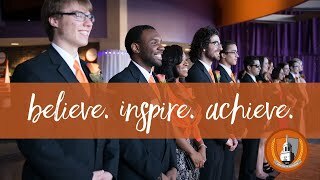 Approximately 200 students participated in the events spread throughout the day in the Campbell Student Union Social Hall. For instance, Elizabeth Enoch, who attended Buffalo State in the 1980s before moving to Kansas, explained what she does as a technical designer for retailer JCPenney and what skills are required. Coughlin conveyed the importance of being willing to take on extra responsibilities and treating everyone with respect and kindness. Cotton Inc. funded the Buffalo State symposium. 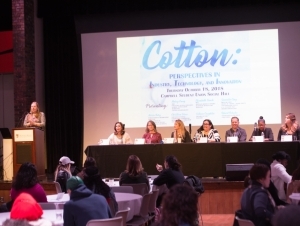 It was part of a grant the FTT Department received to enhance its curriculum and educate students about the role of cotton, technology, and innovation in the fashion industry. “This symposium is part of a bigger initiative that included student applied learning and research projects that were built into five of our classes last spring,” Shephard said.